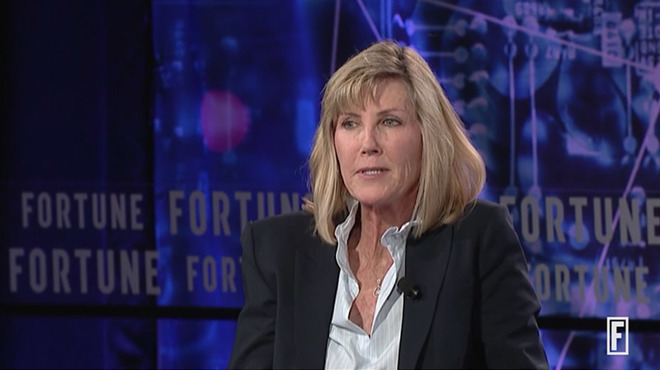 Apple VP Jennifer Bailey at the Fortune Brainstorm Reinvent conference. Speaking with Fortune executive editor Adam Lashinsky at the publication's Brainstorm Reinvent conference in Chicago on Tuesday, Bailey said Apple did not seek to disrupt the payments industry with Apple Pay. Instead, when the company launched the product four years ago, it wanted to introduce an attractive consumer solution that worked in tandem with established payment methods. "When we thought about Apple Pay, we thought, there are a lot of payments out there that our customers already love and trust," Bailey said. "We don't sit around and think about, what industry should we disrupt?' — we think about, what great customer experiences can we develop?'" Apple typically finds huge success in the role of disruptor — see iPhone, Mac and iTunes — but the company's typical approach was not a good fit when it came to the entrenched payments market. Of particular concern was government oversight, according to Bailey. Becoming a credit card replacement would make Apple a de facto financial institution, thus requiring a bank charter and, with it, strict regulation. Bailey was adamant that Apple has no desire to be regulated. Indeed, Apple is looking to expand beyond payments and into what Bailey refers to as access. The company will next week roll out student ID cards for Duke University, the University of Oklahoma, and the University of Alabama in a solution that combines payments with NFC-based building access. Students with compatible iPhone and Apple Watch devices will be able to provision their ID cards in Wallet to enter dorms, pay for laundry and perform other campus functions. Apple appears to be pushing the access angle as a major function of Wallet and supporting NFC-capable devices. Bailey mentioned Apple's work to facilitate adoption in corporate settings, as well as by hotels. Apple itself uses on-device credentials to gate access at its Apple Park campus — a technology showed off at WWDC this year. Both Starwood Hotels and Hilton Worldwide rolled out iPhone and Apple Watch-compatible hotel key cards in 2014, though the implementations were based on the Bluetooth Low Energy protocol, not NFC. Bailey took today's interview as an opportunity to tout recent Apple Pay statistics, saying the payments system should be supported by 60 percent of U.S. retail locations by the end of the year. Further, Apple Wallet is live in 24 countries, unsurprisingly experiencing faster growth outside of Apple's domestic market. The latter metric is likely attributed to consumer familiarity with pre-existing touchless technologies, especially in Asia. As for transit, another key Wallet feature, iPhone and Apple Watch owners can use their devices to ride public transport systems in 12 cities worldwide. Of those, Tokyo, Beijing, and Shanghai integrate closed loop technology, while London and Moscow rely on open loop technology, the report said. Bailey said the product is seeing rapid high penetration in Tokyo, where Apple Pay launched with support for JR East's Suica mobile transit card system in 2016. Finally, Bailey said that while Apple makes money off Apple Pay transactions, the new features coming to Wallet are designed to keep users loyal to Apple platforms.